If you’re looking for an iPhone case that offers top-notch protection but still looks sleek and stylish, you’ve come to the right place. 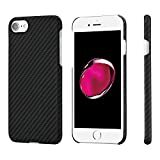 The PITAKA Aramid Fiber iPhone 7/8 Plus Case is made out of actual body armor material, so you know it can take a beating with no problem whatsoever. It also comes in a variety of different woven patterns for an awesome look, and our favorite is definitely the carbon fiber black and gray pattern. Do yourself a favor and check it out. Slim and Sensuous With “Body Armor Grade” Protection and ZERO Compromise, made possible with Aramid Fiber. Now, your phone is protected with the same material used in body armor, spacecraft, jet engines, and Formula 1 Race cars. Yet, it retains the thinness of your iPhone the day you purchased it — before it was covered up with a thick bulky case. Enjoy your “almost naked’ iPhone with a case that is thinner than a dime. Thickness 0.03 inch. Min. Weight 0.28 oz. So light that you even will not feel the weight increase to your phone. Yet, with unparalleled protection from everyday “real world” drops. A Soft 3D-Grip touch. Texture you need to feel to believe. It almost clings to your hand without feeling sticky. Extraordinarily scratch resistant. A protective three-layer coating and manual polishing is applied to each phone case. Now feel confident carrying your phone in purse or pocket along with keys and coins. Easily and naturally access all buttons and ports. Each opening is not only accurately aligned, but also at natural “surface level.” No longer do need to use your pinky’s fingernail to dig under a thick case toggle the Ring/Silent button. 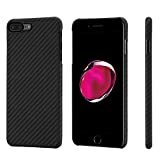 There’s also a version for the smaller iPhone 8 and 7, but unfortunately the black/gray carbon fiber model is sold out.